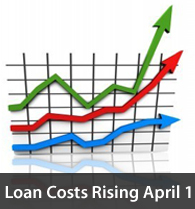 Starting April 1, 2011, loan-level pricing adjustments are increasing. Most conforming mortgage applicants will face higher loan costs. Loan-level pricing adjustments are mandatory closing costs. They’re assigned by Fannie Mae and Freddie Mac, and based on a loan’s specific risk to Wall Street investors. First constructed in April 2009, loan-level pricing adjustment are a means to help Fannie Mae and Freddie Mac compensate for “riskier loans” by bolstering their respective balance sheets. Since the initial roll-out, Fannie and Freddie have amended adjustments five times. The pending April adjustment will be the 6th revision in two years. No class of conforming borrower is exempt from LLPAs. Each loan delivered to Fannie Mae is subject to a quarter-percent “Adverse Market Delivery Charge”. That cost is often absorbed by the lender. LLPAs are cumulative. A borrower that triggers 4 different categories of risk must pay the costs associated with all four traits. Loan-level pricing adjustments can be expensive — as much as 3 percent of your loan size in dollar terms. As an applicant, you can opt to pay these costs as a one-time cash payment at closing, or you can to pay them over time in the form of a higher mortgage rate. The loan-level pricing adjustment schedule is public. You can research your personal scenario at the Fannie Mae website. However, you may find the charts confusing. Especially with respect to which route makes the most sense for you — paying the adjustments as cash, or paying them “in your mortgage rate”. Phone or email your loan officer for help.